Companies with at least one woman on their board delivered excess returns at a CAGR of 3.5% from 2006 to 2016. 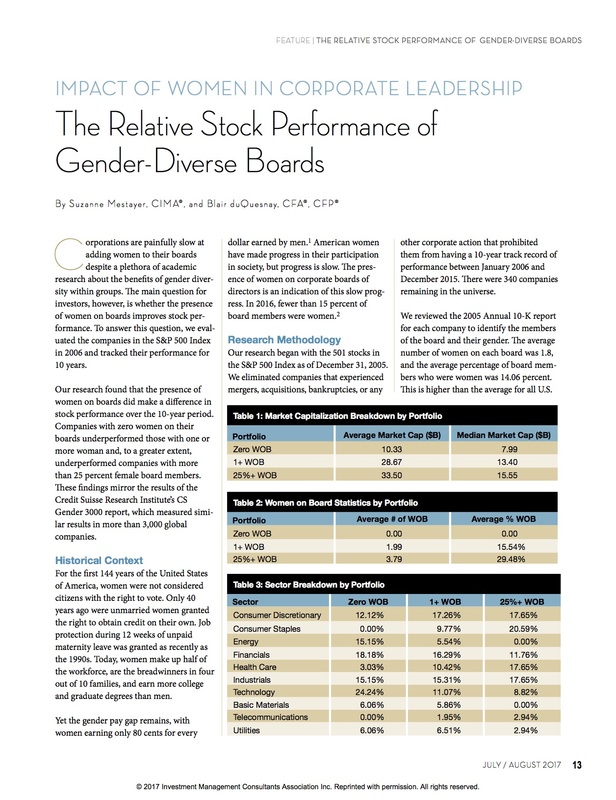 Despite research that linked gender diversity at the top with stronger corporate performance, we saw few investment options that leveraged this compelling research. In fact we saw no strategies that leveraged the gender diversity research to enhance an investment thesis. This is how the Women Impact Strategy Separately Managed Account was born. This Account is a carefully crafted portfolio of fifty companies that are leaders in gender representation within Boards of Directors and executive teams. We started with a universe of over 500 global companies previously identified as leaders in gender diversity and applied a rigorous screening process that considered economic performance indicators of size, value and profitability. We then applied an additioal gender lens screen, seeking companies that are leaders in gender representation at the top. The quantitative ranking and social impact screen is then balanced to ensure an account that mirrors the sector weighting of the Russell 3000. The account is an all-cap core equity holding. What makes the Women Impact Strategy truly unique is that the social impact screen here (investing in companies that are leaders in gender representation) potentially enhances stock performance. We at ThirtyNorth firmly believe that the Women Impact Strategy will prove a win-win for both investors and in helping move the needle on corporate gender diversity that will benefit companies themselves and the consumers they serve. We feel incredibly privileged to introduce this product to you and sincerely thank you for your interest. Our team possesses deep investment industry expertise, an innovative, female-led perspective and a genuine passion for gender lens investing. To download our whitepaper titled, “Impact of Women in Corporate Leadership,” please fill out the form below. 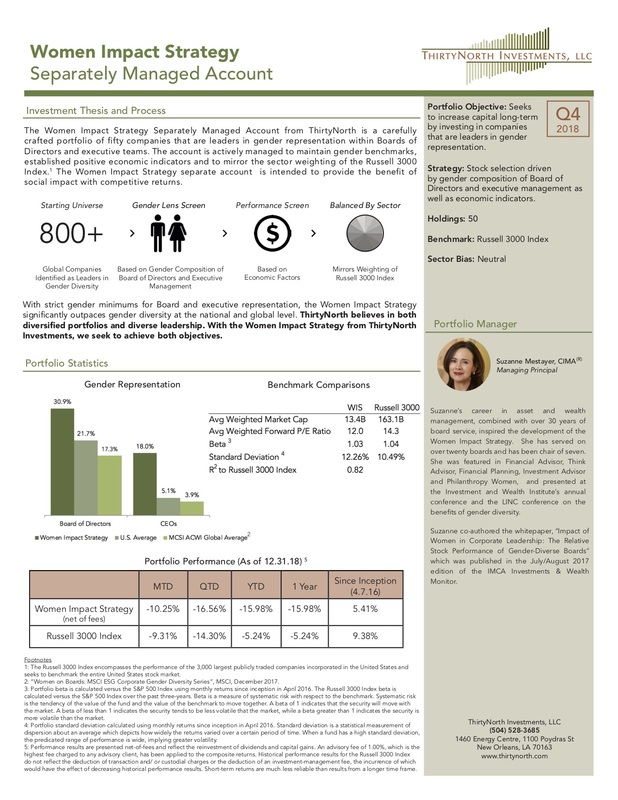 To download our Q4 2018 Women Impact Strategy fact sheet, please fill out the form below. “The CS Gender 3000: The Reward for Change.” Report from Credit Suisse Research Institute, September 2016.